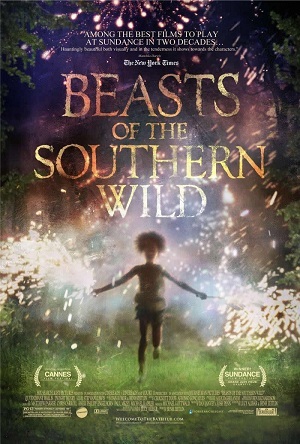 Beasts of the Southern Wild (2012): Directed by Benh Zeitlin. Written by: Lucy Alibar and Benh Zeitlin. Based on the play “Juicy and Delicious” by Alibar. Starring: Quvenzhané Wallis, Dwight Henry, Levy Easterlee, Gina Montana, and Pamela Harper. Rated PG-13 for thematic material including child imperilment, some disturbing images, language and brief sensuality. Running time: 93 minutes. Certain movies remind us that film can be, and is, an art form. So describes Benh Zeitlin’s Beasts of the Southern Wild. Combining image-poetry reminiscent of Terrence Malick (complete with ironic voice-over narration!) and the childlike sensibilities of Hayao Miyazaki, Beasts wowed audiences at Sundance and now has the opportunity to enthrall audiences who seek it out. The film touches on a tender subject, to be sure. Any film chronicling a pivotal incident like Katrina runs the risk of turning people into caricatures and simplifying subcultures (in this case, the Louisiana bayou). Yet everything feels authentic in Zeitlin’s film, even when giant horned pig-monsters called Aurochs show up. It helps that we see the film from a child’s eyes. Hushpuppy, played by the precocious Quvenzhané Wallis, knows both the magic and the pain of life. Our first glimpse of Hushpuppy sees the youngster holding various animals up to her ear, listening for a heartbeat. “Most of the time they say, ‘I’m hungry’ or ‘I gotta poop,’ but sometimes they speak in code.” She speaks with the wisdom that recognizes both knowledge and mystery. Wallis is so natural in the role, from her trademark glower to her own high-pitched war-cry. When the hurricane does hit, we experience it with her. The Aurochs function as a kind of Greek chorus, expounding on tough issues like eroding family relations and climate change, and illuminates them through the marriage of image and word. But Hushpuppy has another hurricane to confront—her tempestuous father, Wink (Dwight Henry). Prideful, alcoholic, and perhaps just a little insane, Wink nonetheless loves his daughter genuinely and completely. We don’t see complicated relationships like these nowadays—a lesser film would have condemned Wink for his poor decisions and glossed over his good ones. One scene between father and daughter oscillates between touchingly playful and downright terrifying. It takes great care and faith in your actors in order for something like that to work, and wow, does it work. Their world seemingly exists outside time, and outside anything we typically imagine America to be. It is a place of perspective and memory, as when Wink recalls his relationship with Hushpuppy’s mother. Her encounter with an alligator creates one of the most stirring images I’ve ever seen on film. I would never do you the disservice of spoiling it—let’s just say that gender theorists could devote entire volumes to it. Director Benh Zeitlin, whose career debuts with this film, handles his material with the flair of a master. He examines his characters fairly and completely, and his cinematography unlocks the beauty and wisdom of an uncharted world. Everything seems so fragile and beautiful here—from the fresh-caught catfish, to Wink’s weather-beaten body, to floating flecks of dust. The screenplay, co-written with Lucy Alibar (who wrote the play that inspired the film) never has to strain, never has to dumb down its material. It is spare and graceful; a story of maturity without disillusionment, reality without defeatism. There are films that take us on an adventure away from life. Then there are the films that remind us of the adventure that is life. This one manages both.